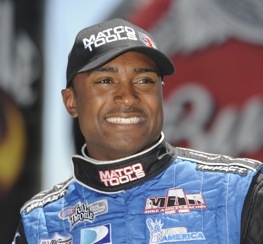 Antron Brown tops in Top Fuel qualifying on Saturday. Antron Brown took over the top spot on the Top Fuel ladder during the single qualifying run Saturday at the Toyo Tires NHRA Nationals at Maple Grove Raceway. The other three classes remained unchanged with Ashley Force Hood (Funny Car), Mike Edwards (Pro Stock), and Hector Arana (Pro Stock Motorcycle) staying in front. Interestingly, all four low qualifiers lead their fields in No. 1 starts this season (Brown, Force Hood, and Edwards hold that distinction on their own, while Arana is tied with Andrew Hines for the most). Much like Friday, Saturday was a day filled with long waits and ultimately just one session completed when rain from the same system that affected activities on Friday continued to hamper efforts to complete both qualifying runs. Rains began late Friday night and continued into Saturday morning. Though the rain stopped early in the morning and things began looking promising around 10 a.m., another byproduct of the wet weather, water seeping through the track, delayed racing into the afternoon. “Weepers” popped up sporadically throughout the Pro qualifying session, but the second, and what was ultimately the final, session was completed in all categories. The Pro Stock Motorcycles returned for another run later in the day, but only five bikes made it downtrack before rain began to fall, forcing officials to call it a day and set the fields based on the previous two passes. The only big change in qualifying came in Top Fuel, where points leader Brown moved around Friday leader Morgan Lucas for the top spot. Brown piloted his Matco Tools rail to a 3.854 to nab his sixth No. 1 start of the season. “The weather conditions threw us for a curveball yesterday, but we made adjustments for it,” said Brown. “[Crew chiefs] Brian [Corradi] and Mark [Oswald] gave the car a little more power. They said, ‘Hold on, ‘Tron!’ That Matco Tools car motored right on through there and squeaked out a No. 1 spot. Lucas slipped to the second spot on the ladder after being unable to improve upon his 3.867 from Friday. Larry Dixon starts race day from the third spot, and Cory McClenathan will begin his quest for a Wally from fourth place. Spencer Massey, Tony Schumacher, Shawn Langdon, and Doug Kalitta round out the top half of the field. Brandon Bernstein’s team struggled on both qualifying runs and will start from the No. 16 spot, giving him a first-round date with Brown. One of the other good pairings of the opening round is Kalitta and Joe Hartley, two of the drivers who are in the battle for the final two spots in the Countdown to 1 field. Kalitta sits ninth in points, and Hartley is presently 11th. Force Hood stayed in the lead in Funny Car on the strength of her 4.114 from Friday, but she enters race day with some uncertainty after suffering a big engine explosion that damaged her car to the point she will need to go to a backup for Sunday’s eliminations. This is Force Hood’s fifth No. 1 of the year. “It’s in pretty bad shape, and I don’t think it’s fixable for tomorrow,” said Force Hood about her damaged race car. “That’s OK; that’s what spare cars are for. It’s a little bit of an uneasy feeling to start tomorrow in a car we haven’t run before, but it looks like that’s the path we’re going down. My guys are ready to get the car together and make a comeback tomorrow. Though the top remained unchanged, there was some shuffling behind Force Hood. Tony Pedregon, last week’s winner in Brainerd, jumped to second with a 4.133 clocking, and Jack Beckman moved to the No. 3 spot with a 4.134. Robert Hight, who was second after Friday’s session, slipped to fourth when he didn’t better his 4.137. Bob Tasca III finished just one-thousandth behind Hight and starts race day from the fifth spot. Mike Neff is sixth, and three of the Countdown contenders are next with Cruz Pedregon, John Force, and Matt Hagan occupying the seventh through ninth spots, respectively. Force and Hagan will square off in the opening stanza. Jeff Arend anchors the 16-car field with a 5.010, and he will face Force Hood in round one. Gary Densham was the lone driver to miss the field after he was shut off on the starting line with mechanical troubles and couldn’t make a run in the final session. Much like Force Hood, Edwards’ final qualifying run was far from perfect. In fact, the ART/Young Life-backed driver was unable to even make a pass when a problem with the line-loc on his entry malfunctioned, causing him to roll through the beams. Fortunately for him, no one was able to better the 6.640 he put on the boards Friday, giving Edwards his ninth No. 1 of the season. Greg Anderson remained second on the strength of his 6.679 from Friday. Warren Johnson will make his best start of the season, third, thanks to the 6.680 he clocked on his first run. Jason Line qualified fourth, followed by Ron Krisher, whose 6.694 was the best run of the day and moved him up to fifth. Greg Stanfield, Johnny Gray, and Jeg Coughlin round out the quick eight. Justin Humphreys was the final driver to earn a spot in the field, anchoring it with a 6.746. Six drivers were unable to break into the field, and surprisingly, Allen Johnson, who has been a consistent strong qualifier all season, is among the nonqualifiers. Johnson struggled on both runs, never making it downtrack fully under power. Johnson’s qualifying streak ends at 52 consecutive races, dating back to the Gainesville event in 2007. Also missing the field were Bob Benza, V. Gaines, Kenny Delco, John Gaydosh, and Dave Northrop. Arana will lead the Pro Stock Motorcycles into race day after his 6.986 held through Saturday’s session. No other rider came close to eclipsing Arana with Hines’ 7.041 standing as the best run of the day. This is the second straight and fourth No. 1 of the year for Arana. Michael Phillips held onto the No. 2 spot, his best start of the season, on the strength of his 7.020, and Karen Stoffer and Eddie Krawiec remained third and fourth, respectively. Hines’ pass moved him up to the fifth spot, dropping Junior Pippin, Douglas Horne, and Shawn Gann down a notch. Matt Smith, whose bike spun hard on Friday’s run and didn’t go down the track under power, rebounded with a 7.076 that placed him ninth. Geoff Godfrey anchors the 16-bike field with a 7.685 and will face Arana in the opening round.